Emirates NBD, the largest banking group in the Middle East in terms of assets, announced today the opening of a new branch in Emaar Business Park, Dubai. The third Emirates NBD branch to open this year has been opened in response to increased demand for services there and in other dedicated business districts, providing customers with greater flexibility and convenience. said Jamal Bin Ghalaita, Group Deputy Chief Executive Officer, Emirates NBD. 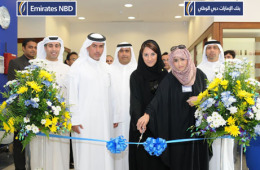 Open from 9AM-4PM, Sunday to Thursday, the new branch will offer the complete range of Emirates NBD services.